Every member of the team has undergone extensive training education and has a history of great results. At Positive K9 Training, you have access to knowledgeable trainers who are looking forward to helping you with your pet. 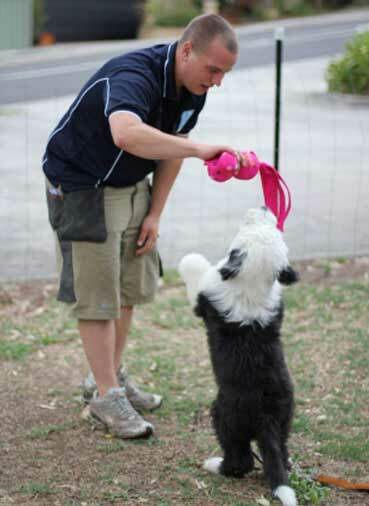 I’m proud of my team and I’m confident this is the best dog training available in Melbourne. You can learn more about myself and each of our trainers by clicking on the names below. Want to speak to us about your dog? You’ll find our contact details below – we’re looking forward to hearing from you. I have a balanced approach when it comes to working with dogs. As long as I can remember, I could be found with a dog and lead in hand. I have had a lifelong interest in the way dogs act, and have constantly wanted to bring the best out of every pet. 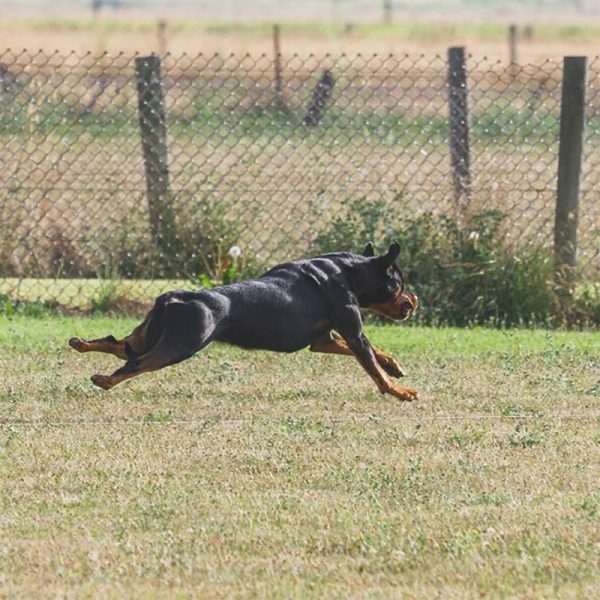 I hold a nationally recognised dog behaviour and training qualification from the National Dog Trainers Federation (NDTF Dog Training and Behaviour Certification Course). Additional units completed: Assistance Dogs Training, Substance Detection Training, Complex Skills and Tricks, Class Instruction. Although knowing and understanding theory is needed and has given me a great edge, there is no replacement for hands on learning and making mistakes which you can admit to and grow from. Every year thousands of dog owners young and old are faced with the headache of helping their pet adapt to their daily lifestyle. Though there are hundreds of different methods that are used to assist your pet in finding his or her place in your life, you cannot be expected to take on this challenge alone. I have been fortunate in working with and learning from many industry leaders whom gained greater knowledge. 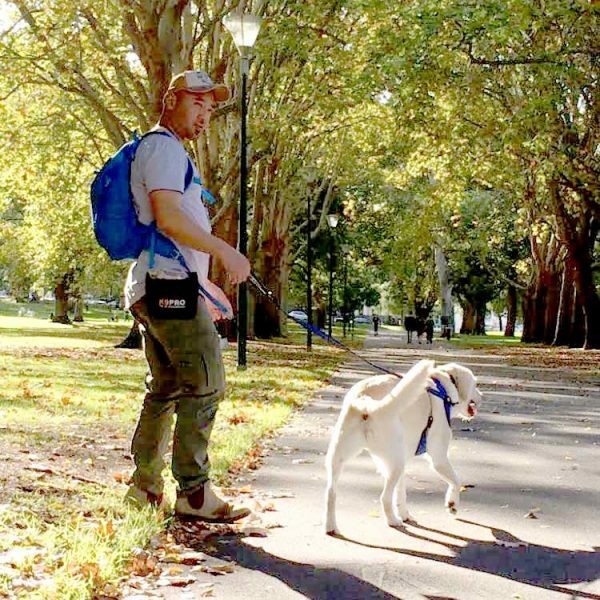 I have also formed many great working relationships with Vets, Breeders, pet shops and other great dog trainers in Melbourne and around the world. I have received comprehensive education in canine behaviour and training and regularly attend industry seminars to further develop my understanding of K9 behaviour. Originally from Germany, Birte was inspired at a young age by watching a neighbour train German Shepherds as police dogs. 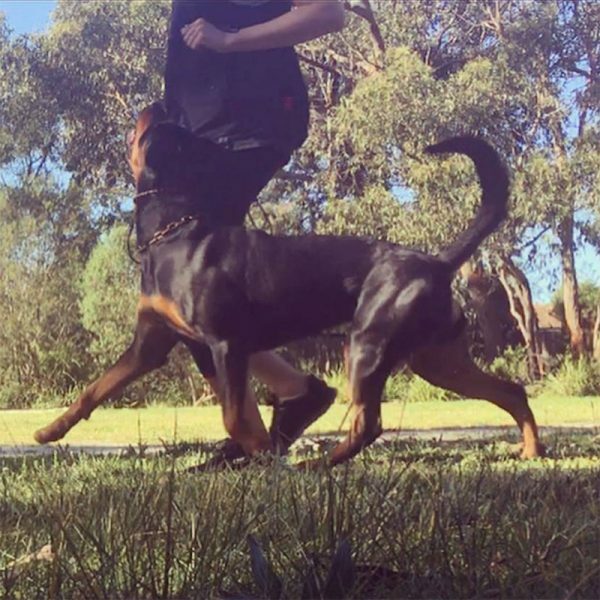 Extensive training education and teaching experience in both Germany and Australia make Birte a real asset to the Positive K9 Training team. I grew up in a small village in Germany and my neighbor used to train police dogs. He was still very dedicated to train his own dog when he retired. I was fascinated watching him and his dog Arko. He gave me some tips and tricks how to train my first dog Eddy. What have you done professionally and personally with dogs? Both paid and voluntarily. 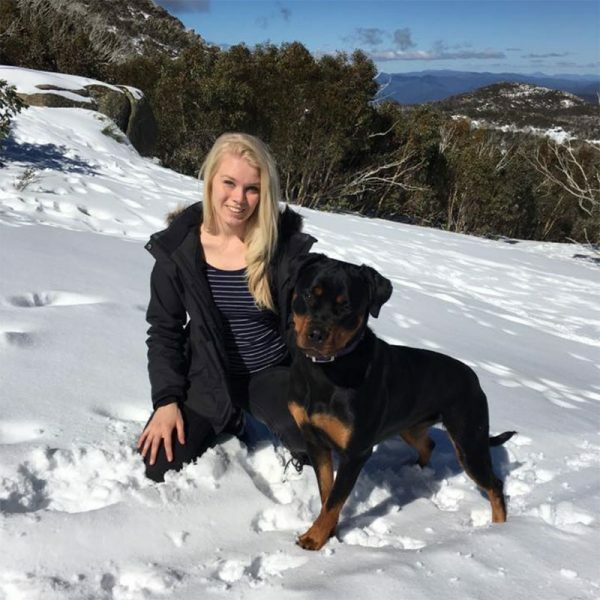 I have trained my dogs at obedience classes in Germany and Australia, work part time as an Animal Attendant at a doggy day care center and do volunteer work as an Animal Behaviour Trainer at the RSPCA. What dog training education have you undertaken? Also what seminars have you attended? What aspects of dog training and behaviour do you have particular interest in? I have a special interest in supporting rescue dogs. They can be a little bit more challenging than getting a puppy but they all deserve a second chance. And there are also some really interesting dog sports like Agility, Tracking and Endurance. What do you enjoy most about working with dogs? Tell us a bit about your own dogs? I have adopted my first dog Ellie from the RSPCA Peninsula in March 2013. She is a crazy Kelpie x Staffy and loves to offer behaviours, that’s why it is so much fun to teach her tricks. Her hobbies are rolling in dog poo and sleeping. My second dog Joey became part of our family in July 2013. We have adopted him from the Australian Animal Protection Society in Keysborough. I think he is a little bit of everything (but was ‘advertised’ as a Kelpie x). He was actually the reason why I decided to do the NDTF course as he had some issues I had to work on and I wanted to do it right from the beginning. Now he is a really happy boy that loves nothing more than his ball and some big cuddles! What are your best two pieces of advice you can give to dog owners? – Be fair to your dog, ‘yes’ is so much more important than ‘no’. – Make sure that you and your furry friend are always enjoying training. Keep it fun and interesting for you and your dog and never train your dog when you are stressed or in a bad mood. Growing up I would watch a famous English dog trainer, Barbara Woodhouse on the TV – from then on I was hooked! 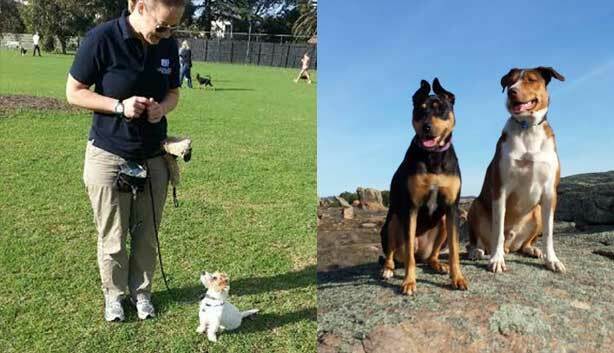 Both paid and voluntarily – I’ve attended traditional dog obedience classes with my own dogs since the age of 15 and have always been facinated with the species. 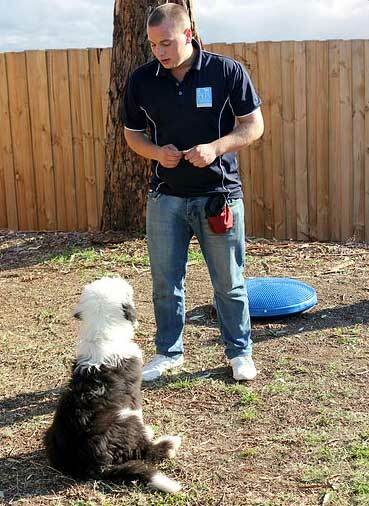 My dog Peppa and I enjoyed being members of the Dog Agility Club of Victoria for a while and over the last 5 years I have volunteered as a dog walker at Pets Haven in Woodend and Animal Aid, Coldstream. I am interested in all aspects of dog behaviour and particularly love any form of training/activity which involves dogs using their natural senses, instincts and abilities, such as scent detection and agility. 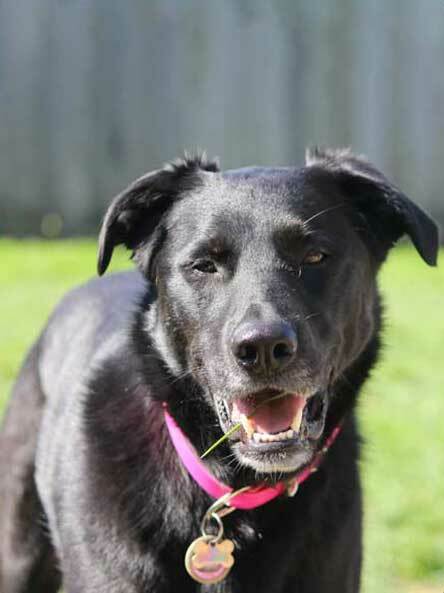 Peppa – 8 year old Border Collie x Kelpie. I adopted peppa from Pets Haven animal shelter, Woodend when she was approx 7 months old. Peppa is VERY ball motivated and loves doing aglilty, and swimming in the creek. 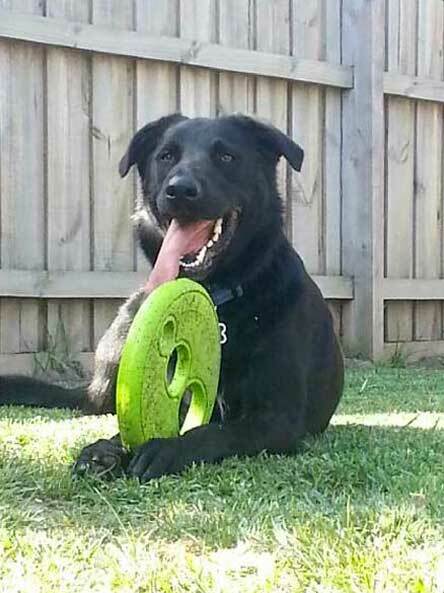 Woody – 7 year old Labrador X, adopted 2 years ago from Forever Friends rescue. Woody loves anything which means he gets to be the centre of attention, playing with Peppa and riding his skateboard! – Be calm, clear and consistent when communicating with your dog – and remember often words are not necessary – dogs mainly read your energy and body language. – Do not under estimate the benefits of keeping your dog mentally stimulated. – Exercise is great but dogs brains need a work out too! I’ve always grown up with dogs and trained the family dog. I didn’t get serious about it until I adopted siblings from the pound and knew I would have my work cut out for me! I have instructed classes locally, however most of my experience comes from helping foster dogs with their rehabilitation in various rescues, including my own rescue group. I have also attended training classes personally with my dogs, I also enjoy attending dog sports with my dogs including dock jumping and nose works (scent work). Rescue dogs are my soft spot, I really enjoy the opportunity to be able to rehabilitate a dog that we really have very little background on. I’m interested in all aspects as it is a full package that moulds to each dog. What’s not to like? I’m one of the lucky one’s that gets to work with these amazing animals. 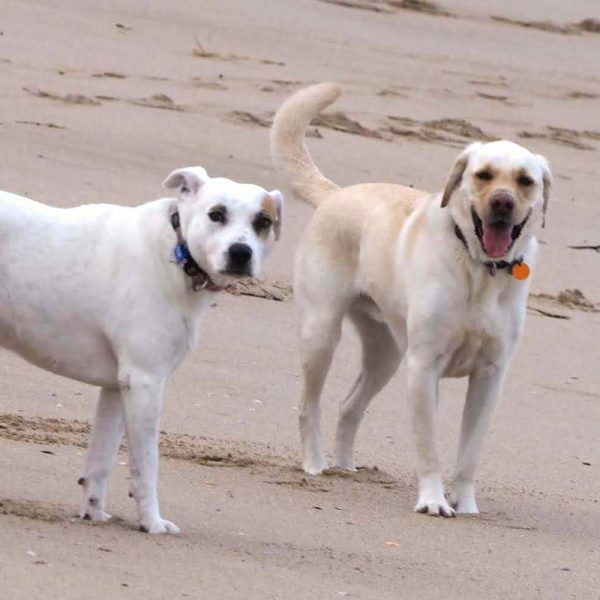 I have 3 dogs – Sammy & Buca, they are my rescue babies and were saved from Mildura pound at 4 weeks of age Christmas 2011, they will be 5 this October. 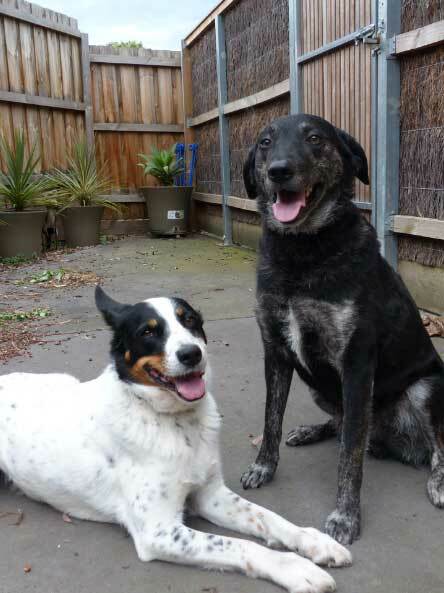 They are Border Collie x Kelpie x Lab. These guys are super fun, I love playing frisbee with them both, I like to call Buca my obedience dog and Sammy my tricks dog. These 2 love nothing more than a game of chasey in the yard! My third dog is 6.5 and a wolfhound x called Ollie, Ollie is totally obsessed with his ball. So we have plenty of ball time with him!!!! Your dog is continual work in process right through from the day you get them until they leave us! Mental stimulation is key it will keep your dog out of trouble. 1. How did you get started with dog training? Throughout my childhood we always had dogs, I would spend my time outside with them on walks, camping, riding my horses or teaching them tricks. When I grew up and moved out of home I got my own dogs and it was here that I developed a real passion for training. 2. What have you done professionally and personally with dogs? weight pull, back packing and endurance. 3. What dog training education have you undertaken? Also what seminars have you attended? 4. What aspects of dog training and behaviour do you have particular interest in? – I have a strong passion for precision obedience however I also enjoy many other disciplines. – Of course working with puppies is another passion of mine. It is very fulfilling helping a family with their new puppy and working with them to reach their training goals as their puppy grows and develops. 5. What do you enjoy most about working with dogs? I love watching the relationship and bond develop between our clients and their dogs as their training progresses. 6. Tell us a bit about your own dogs – Age, breed, what you enjoy doing with them? What they most enjoy. Bailey is my 5 year old Whippet. Despite being a pro at zoomies he truly is a calm, chilled out little guy. He enjoys swimming at the dog pool, running along on bike rides, lure coursing, rally obedience, flyball and agility training. Sage is 2.5 year old Rottweiler. She is the exact opposite of Bailey, full of beans and always ready to do something. 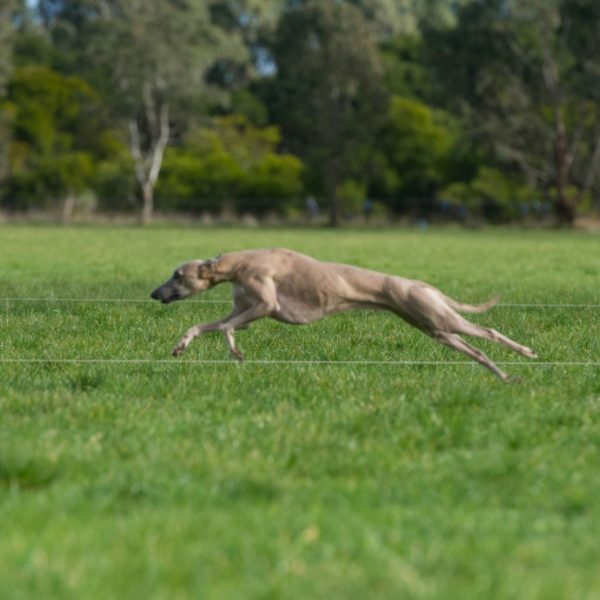 Sage is currently in training for precision obedience, tracking and lure coursing. Once she is old enough she will also have training in herding weight pull, endurance and back packing. Sage was raised by her breeder using the puppy culture system. As result she is an enrichment seeker, very operant and enjoys working. Both dogs enjoying hiking and camping on our days off! 7. What are your best two pieces of advice you can give to dog owners? Always be aware of what your dog is feeling! This means do your best to learn about dog behaviour and body language. Your relationship and your training will dramatically improve if you are aware of what your dog’s behaviour is telling you. Be clear and consistent! I am always telling clients this! Your training won’t progress if you don’t and your dog won’t know what is expected of him. Eg. rather than saying “Fido can you please sit for mummy”, just say “Fido sit”. We chatter to our dogs too much and this confuses them, and also enables them to check out as half the words you’re saying don’t mean anything to them. Secondly, be consistent. If you ask for a behaviour and you’re sure you were clear, you must follow through with it! This creates reliability! I got started training with my German Shepard puppy Bella at Vets on Parker in 2013 and Chris was the trainer. All my training and involvement with dogs has been done with Positive K9 Training, I first started training with my GSD Bella and my interest grew from there. I am most interested in obedience. I prefer a dog that is well behaved, rather than one that does tricks. I love “problem children” & watching them & their owners “getting it”! Tell us a bit about your own dogs- Age, breed, what you enjoy doing with them? Bella is an almost 4yo GSD, she is my baby girl. I love just spending time with her either at home or out & about. She is so smart & easily trained. She has a wonderful personality & makes me laugh every single day! Yes she loves to run around at the park chasing balls, going for walks or just snuggling on the couch/bed. a) Breathe/Relax. It took me a long time to understand that. The dog doesn’t always know what you want. Don’t get frustrated. If you do, STOP TRAINING & RELAX. Dogs feel the tension. b) Be Consistent…..you can’t correct sometimes & not others. eg Don’t give him/her an old shoe to chew on & not expect them to chew up you $200 Nikes. They don’t know what is expensive & what isn’t. Give them their own dog toys. How did you get started with dog training. I grew up with animals, such as gold fish, turtles, birds, frogs and so on. I wasn’t allowed to have any mammals when I was living with my parents but I’ve kept reading books about dogs since I was a young child. When I got my own place, I started dog training with my dogs seriously. I had tried several dog training classes and technics and then I met Chris in 2015. What have you done professionally and personally with dogs? Both paid and voluntarily. I have attended local dog classes with my dogs and then PK9. I’m volunteering at Blue Cross Animal Society as a dog trainer. I love being surrounded by lots of dogs and doggie people and talking about dogs as much as I want! Eildon: a middle-aged Golden-retriever × Labrador. He is very friendly with other dogs and humans (sometimes, too friendly). Eildon enjoys retrieving, learning new tricks, long walk and swimming. He taught me how amazing dogs are and I decided to become a dog trainer. Keely: a young-adult Stuffy × Australian stumpy-tail cattle dog × Bull Terrier×…whatever. She is a calm, easy going girl. She loves interactions with humans (not really with other dogs) and warm sunlight. She is reactive with cats so we are working on it (getting less reactive). 1. If you want your dog to be calm, you have to be a calm person first . 2. Brush your dogs teeth every day.